The calculations of power dissipated, energy stored, and Q-factor are physically meaningful in the steady-state sinusoidal excitation regime. However sometimes we are interested in the total power dissipated in the circuit when it is excited by a pulse of limited duration. This requires performing time integration of power dissipated. 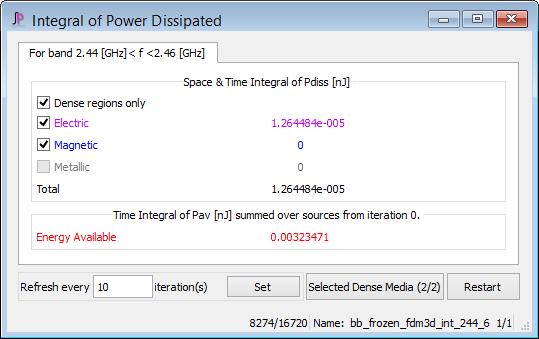 Such information is available in Integral of Power Dissipated window. This feature delivers Space & Time Integral of Pdiss in [nJ], given for both electric and magnetic fields. The results of time integration of power available from the source in [nJ] is also available. The time integral of power available from the source is summed over all sources and the starting iteration is indicated in the Time Integral of Pav frame title. See also Dissipated power and dissipated power density - time integral and online documentation about time integral of power dissipated.